Put each of the books in the Bible at your fingertips. A total of 84 elegant foil-edged tabs are designed for Old and New Testaments, as well as tabs for additional books found in the Catholic Bible. Also includes a selection of special tabs for marking your own Life Verse, concordance, and more. Design derived from The Psalter in the German Translation of Martin Luther. Deluxe Majestic Bible Tabs by Museum Of The Bibl was published by Worthy Publishing in September 2017 and is our 7973rd best seller. The ISBN for Deluxe Majestic Bible Tabs is 9781945470233. 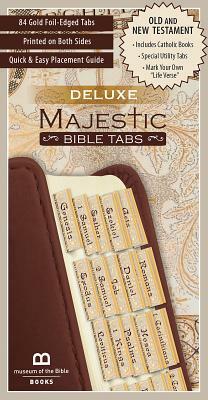 Be the first to review Deluxe Majestic Bible Tabs! Got a question? No problem! Just click here to ask us about Deluxe Majestic Bible Tabs.